Trail: Gabrieleno Trail from Red Box to West Fork Campground. Return to Valley Forge via Rincon Road and follow the Gabrieleno Trail back to Red Box. *Note: My original reason for returning to Red Box via Rincon Road was to avoid a number of downed trees along the Gabrieleno Trail between Kenyon Devore and West Fork. Opportunities to see and cross the San Gabriel River along Rincon Road which doesn’t occur along the corresponding section of the Gabrieleno Trail make this worth doing as a loop to Valley Forge Campground even when the trail is cleared of the downed trees. Track map for Red Box to West Fork Campground, Rincon Road to Valley Forge Campground to Red Box from June 2017 using Backcountry Navigator (US Forest Service-2013 map) from my phone. Stats: 9.9 miles, 1,810′ of gain and loss. Route description: From Red Box, follow the Gabrieleno Trail to the junction leading to Valley Forge Campground. Stay on the Gabrieleno Trail passing the junction for the Valley Forge Trail (that leads to Eaton Saddle), passing the junction with the Kenyon Devore Trail (that leads to Mt. Wilson) until reaching West Fork Campground. From the Campground follow Rincon Road west back to Valley Forge Campground. The junction for the campground isn’t marked. However, there is an obvious wide path leading down to the campground from a hairpin turn in the road. 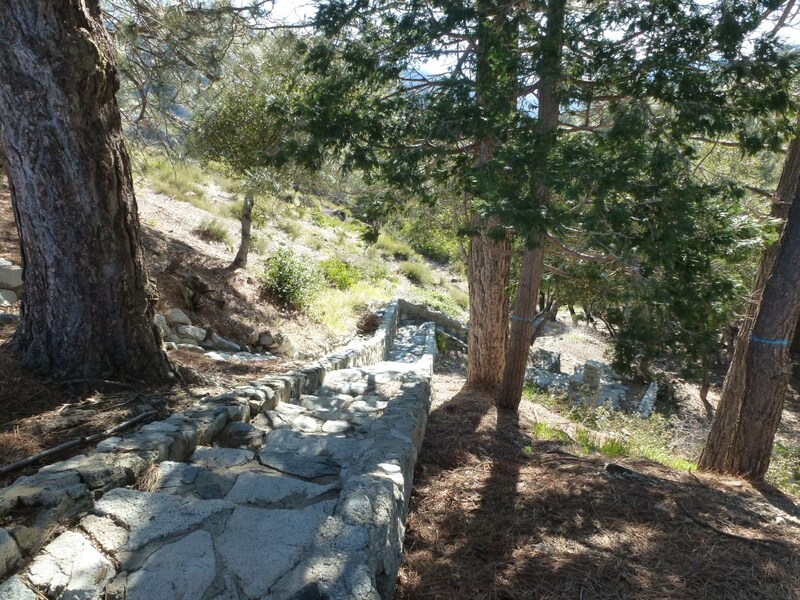 Walk through the campground and follow the spur trail leading up to the Gabrieleno Trail. Follow the Gabrieleno Trail back to Red Box. View of the San Gabriel River from Rincon Road between West Fork Campground and Valley Forge Campground. (6-4-2017).